Radicular pain or radiculopathy is a condition in which the nerves stop working properly. Disease or trauma may cause the condition, which is a malfunction in the root of the nerve. It can result in pain, numbness, weakness and motor control. Even though the problem occurs in the spinal area, the pain is often felt in other parts of the body. Many cases of radicular pain occur in the cervical spine and result in severe neck pain and other symptoms. Patients may turn to an epidural nerve block procedure for treatment, which may be compensable in a personal injury claim if another party caused the injury. What are the causes of cervical radicular pain? In many cases, a herniated disc, usually the result of trauma such as a car accident or a fall -- such as a slip-and-fall accident -- causes cervical radicular pain. Radicular pain also may be the result of arthritis or other types of degenerative bone disease. 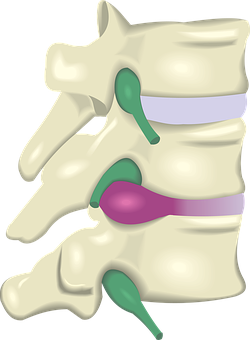 The material from the ruptured disc can put pressure on the nerve root, compressing it and causing pain. What are traditional treatments for cervical radicular pain? Many patients suffering from this condition have treated it with conservative therapies first. They may include corticosteroids and pain medication to varying degrees of effectiveness. Treatment may involve injectable treatments, though some patients take medication orally. Patients should speak with their doctors about the benefits of each type of medication. Physical therapy may be another part of a typical treatment plan. This might include cervical traction, which involves either mechanical or manual traction. A physical therapist might use other methods to relieve symptoms as well. When conservative treatment fails and the pain becomes intolerable, then surgery is often the next step. However, there is another treatment called the epidural nerve block procedure that may provide pain relief. What is the epidural nerve block procedure for cervical radicular pain? This involves injection of a corticosteroid into the epidural space of the spine. The physician will use a fluoroscope to allow use of real-time X-ray images. A contrast medium allows the doctor to ensure that the needle is placed appropriately when injecting the medication. It involves injection of a local anesthetic like lidocaine and a corticosteroid into the epidural space. The pain relief is monitored for a set period of time. This procedure is minimally invasive and may be an excellent alternative to surgery. Complications are slight and include risk of infection, slight bleeding and minor pain around the injection site. Discuss the full range of possible side effects with the doctor before receiving any injection or treatment. What if another party caused an accident that led to cervical radicular pain? Living with cervical radicular pain is not easy. The patient's life becomes about pain management. Patients may be unable to work, sleep or enjoy everyday activities. If you suffer from this disorder because of an accident that someone else caused, speak to an attorney. You may be able to get compensation for damages like medical bills for epidural nerve block procedures to relieve the pain. Damages for lost wages, pain and suffering, and more may be recoverable as well. If you suffered a neck injury as a result of a personal injury, car, or work injury accident, call Walker, Billingsley & Bair in Des Moines for help pursuing fair compensation. Our lawyers can help you seek compensation for injuries and damages. Call us today at 888-435-9886 or contact us online to set up a free, confidential appointment with a lawyer.